Clinical Exome Sequencing: Hope for Rare Genetic Diseases? Biomedical researchers have often been insulated from the patients they’re studying. At such a distance, it’s sometimes hard to appreciate the day-to-day struggle of people with genetic diseases. That’s why I like this dual perspective: A study in the Journal of Medical Genetics describes the exome sequencing of 12 patients rare genetic conditions; accompanying it is Hunting Down My Son’s Killer, a blog post by the father of one of the patients chronicling his family’s struggle in understanding the boy’s disease. Additionally, the researchers required that the proband and both unaffected parents were available for exome sequencing, that previous genetic testing (Affy 6.0 SNP array) had been normal, and that there were no teratogenic or accidental events in the proband’s life that might be causal. Their analysis also made use of 830 presumably-undiseased control samples that were enrolled at Duke for human genome variation studies. Putative recessive or X-linked variants that were homozygous in the proband and but never homozygous in the parents or any control. Putative de novo variants heterozygous in the proband but absent from parents. Compound protein-altering (missense/nonsense/frameshift) heterozygotes in a single gene that did not occur together in the parents or controls. The authors generated, and confirmed in a CLIA setting, the likely genetic diagnosis for 6 of 12 patients studied. On the other side, the patients’ side, is a riveting tale of parents whose son began showing signs of developmental delay at 3 months. A suite of other symptoms followed, accompanied by various hospitalizations, mis-diagnoses, and failed treatments. Several times, the father writes, someone would ask him and his wife “Are you two sure you’re not related?” He’s from an Ohio farm family and she’s from Puerto Rico. So, no. (And, “Duh!”). Alternatively, some doctors took the wife aside and asked, “Is it possible he’s not the actual father?” Wow, great bedside manner. At last, the exome sequencing study revealed a likely genetic cause for the boy’s disorder, and suggested a potential treatment. A good thing on both accounts, as the mother was pregnant again. They had a daughter who, fortunately, did not carry the mutation. This is just one family’s chronicle – there are eleven other families with similar struggles whose story we haven’t heard, and six of them, sadly, have not yet found the answer in exome sequencing. One of the world leaders in genomics and next-generation sequencing is ramping up. The Genome Institute at Washington University has had a busy year already. In January, TGI and its collaborators published three Nature papers that came online the same day: one on the genetic basis of an aggressive pediatric leukemia, another on genomic and epigenetic analyses of childhood retinoblastoma, and a third on tumor evolution in relapsed AML. In February, the funding period began for “A Turnkey System for High-Throughput Variant Discovery and Interpretation”, a U01 grant under which TGI will improve and share its genome analysis tools with the research community. And now, there are job openings in four different groups at the Genome Institute. TGI won a four-year, $805,000 grant to develop its analysis pipelines into A Turnkey system for High-Throughput Variant Discovery and Interpretation (NIH project link), one of several informatics grants reported by GenomeWeb’s BioInform last month. TGI has spent years developing a computational framework and innovative tools for NGS analysis, with a particular emphasis on variant discovery and annotation. The goal of the project is to make these tools available to the wider community, both individually and as part of a complete informatics solution from alignment to detection to interpretation. This “turnkey system” will be flexible and powerful enough to be adopted by experienced laboratories, and user-friendly enough to give push-button analysis capabilities to groups with little bioinformatics expertise. Bottom line, anyone will be able to run “Washington University Genome Institute” analysis on their sequencing datasets with little bioinformatics expertise. TGI’s Human Genetics Group is looking for a statistical geneticist or biostatistician to work with a dedicated team of researchers investigating inherited human diseases. As you might expect for a major genome center, there are many projects from small family-based studies to large trio studies to massive studies of complex disease involving thousands of unrelated samples. We are looking for someone to help evaluate, design, and execute statistical analysis plans for sequencing projects. For more details, see Job Posting 23423. The Medical Genomics Group is looking for a postdoc research associate in the area of cancer genomics. There are many such projects here, ranging from studies of a single tumor to large-scale studies involving thousands of samples. The ultimate goal is to translate discoveries enabled by next-gen sequencing into medically actionable information. As such, an individual who can assist in the development, implementation, and application of algorithms to characterize and interpret sequence variation in the context of cancer is needed. For more information, see Job Posting 23424. There is also a postdoc research associate position open in parasite genomics, as part of an established and successful research group focused on integrating ‘omics’ approaches aimed at understanding organisms at a molecular level. This group is working on comparative analysis of parasitic helminthes to identify conserved and/or taxonomically restricted proteins that may prove useful as antiparasitic drugs. The responsibilities will include design, development, testing, and implementation of software applications for comparative analyses. For more information, see Job Posting 23361. The analysis pipeline group has a position open for a software engineer in data management & compression. The job will entail working on a team of 20 software engineers on next-gen sequence analysis pipelines, focusing on utilizing the information management capabilities of the analysis system to migrate data appropriately between different tiers of storage and eliminate data duplication. Responsibilities will include development, integration, and support of software tools/pipelines/databases in collaboration with data analysts. For details, see Job Posting 23269. I’ve always been a fan of Bowtie, one of the first algorithms to leverage Burrows-Wheeler Transform for short read alignment. When I first encountered it in 2008, it was incredibly fast. Faster than Maq and Novoalign, two of the early popular algorithms for read mapping. Perhaps more importantly, it was ultra memory-efficient, enabling one to map millions of reads on a typical desktop computer. You’d still need the technical expertise to do anything with the alignments, but hey, it was a start. I liked it enough that the first version of VarScan included support for native Bowtie alignment formats (this was before the widespread adoption of SAM/BAM format). Despite these features, Bowtie had a few limitations: First, it required all reads to have the same length and had an upper read length maximum that made it essentially incompatible with Roche/454 data. This wasn’t a big problem, because there were other aligners for 454 data that could handle its moderate level of throughput. Even though it was faster, Bowtie was less suitable for paired-end data than Maq because it didn’t leverage the mate pairing information to improve alignment – it simply attempted to map each read in the mate pair independently, then went back to calculate the distance between them. This was kind of a bummer, but still made Bowtie quite suitable for fragment-end data which had the majority in 2008. Another Bowtie limitation was that it didn’t align reads with gaps. In other words, if a read contained an insertion or deletion relative to the reference sequence, Bowtie wouldn’t map it. Side note: This also would have prevented Bowtie from working on Roche/454 data (and later IonTorrent data) due to the known homopolymer-associated sequencing errors. At the time, however, everyone was still struggling with SNP detection in next-gen sequencing data, so ungapped alignments weren’t a dealbreaker. In time, though, as our capability to detect insertion/deletion variants (indels) increased — due to algorithmic developments as well as longer reads — gapped alignment became more and more important. Benjamin Langmead, the developer and first author, once mentioned to me that it was the most-requested feature for Bowtie. The demand undoubtedly continued to increase as aligners such as BWA offered similar speed and memory performance, while making efforts to align reads across gaps. In paired-end data with one read anchored, BWA will even perform a more sensitive Smith-Waterman alignment to align its mate while allowing gaps. There was also Novoalign, a commercial aligner, which seemed the most sensitive to gaps in reads according to findings by Heng Li, myself, and others. Interestingly, the Pindel algorithm, which identifies indels by splitting up the unmapped mate in a read pair where only one read mapped, nicely complements this limitation. In fact, the original Bowtie software paired with Pindel seems like it would be a powerful combination for efficient read mapping with indel detection. Several subsequent releases of Bowtie addressed some of the early limitations, and continued to increase its performance. And finally, we got the gapped alignment feature we were waiting for in Bowtie 2, which was just published in Nature Methods. 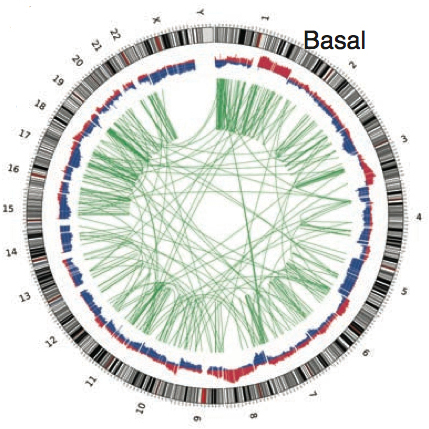 Seeds are aligned to the reference genome in ungapped fashion using the compressed index. Here, Bowtie leverages the speed of its “full-text minute index” for ungapped alignment to rapidly place seed segments without gaps, and then an accelerated algorithm to do the full read alignment with gaps. According to the authors, it’s a combination that allows for high speed, sensitivity, and accuracy. The ability of this new Bowtie algorithm to align with gaps will also aid RNA-Seq analysis using the TopHat package, which utilizes Bowtie as its core aligner, because the gaps that are present in mature mRNA are likely to be better handled. Bottom line, even if you’re using something else to align reads right now, Bowtie might be worth a look.